In mid-July, I received an email from Mia Salituro requesting an email interview which is posted here. After reviewing Mia’s background, I was intrigued by her Networking Newbie blog and aspiration to find a position with Ogilvy & Mather (Note: My first PR job was with O&M Taiwan as a translator!). Part of Mia’s approach is to interview one person per day (more like a week I believe) and leverage this expanding network to make inroads into the company. I asked Mia to share her thoughts and the reaction to her unique approach to date. Personally, I think she’ll find a position – what do you think? What have you done to pursue your dream job? 1) Why did you start Networking Newbie? I began networking as an international model and since then have learned that networking is one of the most beneficial tools we have to fueling our success. I may be in the small city of Kenosha, WI in the physical, however the Internet allows me to network with business professionals and entrepreneurs worldwide. One day I am interviewing an SEO expert from India, the next I am speaking with the CEO of an advertising company in Dubai. Networking Newbie has allowed me to maximize my summer holiday and use it to connect with inspiring business professionals and entrepreneurs worldwide. 2 ) You’ve expressed an interest to work for Ogilvy. How is Networking Newbie helping you to achieve this? I aspire to work in PR for Ogilvy. Already, those in my network have been reaching out offering to help me pursue this dream. On July 6, the day of my first interview post, I e-mailed Lori Bizzoco, a 15-year PR veteran turned writer (www.loribizz.com) who I intern for and asked her if she had any questions to ask editor Isobella Jade and directed her to my site. Lori replied back, ” I don’t have any questions for Isobella, but I have one for you. It says on your site that your dream is to work for Ogilvy? Is that true? Given my PR background, I would be happy to help you make some connections. One thing I know, is that you are on the right path to making your dreams come true.” I think that this quote speaks for itself. In addition, I plan to contact the managing directors of Ogilvy Shanghai and Ogilvy Hong Kong to invite them for an interview on Networking Newbie. 3) Who do you contact and why? I contact those who I feel will not only serve as inspiration to me, but also to my readers. I am personally interested in PR,advertising, marketing etc., however I think that anyone can admire an entrepreneur regardless of their industry. For example, I interviewed Justin Beck, CEO of PerBlue, software startup in Madison. I am not particularly interested in software however Justin’s story is truly inspirational. He was 21 when he became the CEO of PerBlue . Lately, I have been sending interview invites to young entrepreneurs such as Justin Beck. My most recent young entrepreneur interview features Ryan Meinzer, CEO of PlaySay, foreign language learning program. I’ve also interviewed Jason Pereira who at the age of 19 has already owned an offline business in Bangalore and an online business in Dubai.These are the type of people that we should model ourselves after. 4) What has the response been to those you’ve reached out to? Initially, I wasn’t sure what the reaction would be. Perhaps those whom I looked up to were much too busy to answer my questions. I am pleased to say that those whom I have contacted have been more than happy to participate. Many have even offered me advice, beyond my interview questions. I have received loads of encouragement. Receiving advice from such inspiring individuals is worth every bit of the work I put into Networking Newbie. It is very refreshing to see such busy people take time out of their hectic schedule to answer my questions. It is greatly appreciated. I had an interesting conversation with Steve Gershik who writes Innovative Marketer the other day. We discussed his recent post, “An open letter to PR agencies…” which highlighted some of his frustrations over a recent PR agency search. For me, I come from the PR agency background. I truly support PR and want to see PR agencies succeed. But unfortunately, since going in-house, I have to agree with Steve’s points. For this video, I highlight my three points that go beyond PR agencies and vendors in general. People like Steve and I are managing entire marketing programs. For me, I cannot manage the vetting process from beginning to end so I work with my colleagues to help me in the process. Don’t try to circumvent that process by trying to reach me directly. In fact, you may lose the business as a result. And for PR agencies, would you go around a reporter to the editor becuase you thought the reporter was too slow? I guess it depends but you would think twice before doing that becuase of the remifications, right? What do you think? Are there any other points to consider? 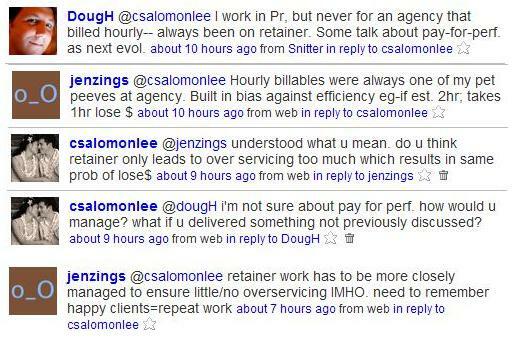 PR Agency – Retainer Becoming More Popular? 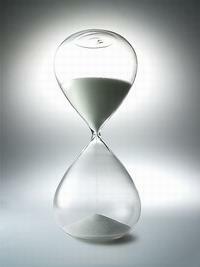 Over the past few weeks, I’ve been hearing that more agencies are working on projects on a retainer basis vs hourly. My understanding is that the retainer enables an agency to focus on the work versus the administration. – Are smaller/boutique agencies the only ones doing this? – Does this result in better quality work? – Does this mean there is less “nickel and diming” since it’s a set retainer? Heck, being in-house, I like this. I know what my budget is on a month-to-month basis. No ugly surprises. No explanations to my boss and finance department. What is there not to love. I would love to hear from PR agencies and other folks – in-house or agency. Which is better – montly retainer or monthly projections billed against hours?